Discussion in 'Computers, Hardware, and Operating Systems' started by DD5XX, Jul 31, 2015.
performing PSK31 and other digimodes, I want to try and to start learning that. as I am learning CW, it would be nice, to decode CW signals on-the-fly. When I bought the RT Systems software to program the radio, it came with a cable . . . I use that one for what you describe above with my FT-857D. For programming channels and controlling your radio with the computer you would need this cable, the YAESU ADMS-4BU. For digital modes you could homebrew this audio cable. I also found this cable for sale on eBay which should work. A third option is to buy a SignaLink USB audio interface and use that. To do digital modes you also need software on your computer, like fldigi. Decoding CW would use the same audio cable/interface as described in the previous paragraph. But once again, you also need computer software like fldigi. The interface cable between your computer and radio's CAT port, is an RS-232 Level Converter (UART--RS-232). For the Yaesu FT-857(D) the Yaesu CT-62 cable (purchased option) provides this connection. I likely have that cable in my "parts box". The electronics (MAX232 equivalent) inside the CT-62 connector shell is powered by the Radio's port. 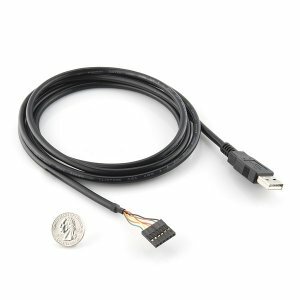 For connection to a computer's USB port, instead of the RS-232 (DE-9M) port, FTDI makes some very nice USB to UART cables. This should work, when properly wired to a MINI-DIN 6-pin connector (same connector type used for PS/2 computer keyboards/mice) for your FTDI cable to attach to the FT-857(D). The FTDI cable is powered by the computer's USB port (+5 VDC) which is part of the USB standard. Same FTDI cable (w/o SparkFun markings), with tinned leads, from Mouser. Mouser Electronics $ 20.00 .... 988 cables IN STOCK. Yaesu CT-62 interface cable can be easily replaced with the simple home-made interface (schematic below). The CAT port, for the FT-857(D) is the 8-pin mini-DIN connector. This port uses a 3-wire serial configuration. Cable MIS-WIRING can damage the radio and/or attached devices. ATAS-100/ -120 Active-Tuning Antenna System. using the CAT system, and for interconnection to the VL-1000 Linear Amplifier. RTS, RX, TX, 5V, CTS, GND (RTS is the green cable and GND is black). Left to Right, photo below. Pin 1 marked with arrow. (notice how the color assignments for resistor color order, in photo). since Yaesu does not provide RTS/CTS, you may need to jumper/short those wire on FTDI cable). THEN another alternative for CAT control exists. Bob Wolpert, K6XX documents how to use the front panel MIC (microphone) jack to support a CAT connection to your computer. (See K6XX document: Using the FT-857 Microphone Jack for Serial Control). Other idiosyncrasies with FT-857(D) transceiver. Quirks and Undocumented features by K6XX. The CAT connection uses pins 3, 4, and 5 (on this port) for a 3-wire Serial (TTL) UART. Protocol converted to USB standard via a UART to USB Bridge chipset. DEPENDING on the Source Serial Device; Conversion device; or Conversion Design used -- the RxD and TxD lines may be connected Straight Through or Crossed (Null modem style).